What a gorgeous piece, Andrea!! And the perfect day for fun!! Considering that I'm 9 inches shorter than you are, it could be a dress for me!! LOL! But I love it as a tunic, especially with the white jeans!! Thanks, Jodie! Yes, this would work beautifully for you as a dress with a pair of your gorgeous heels! That's a beautiful tunic! I love the high/low hem and the lace detail. Looks and sounds like you had a very tasty vacation! Thanks, Mary! I love the lace and the high/low, too! I love tunics too! Great pics!! Very nice tunic! The vineyard looks beautiful! Fantastic tunic! I love the sleeves! And a high low is always so elegant. That food looks delicious, I love good mozzarella. Thanks, Nancy! And, yes, I think high/low gives so much interest to an item. Good mozzarella and tomatoes is my favorite summer food! Thanks, Elaine! Goat cheese tastes somewhat tangy and can be a bit of an acquired taste... It's often paired with something sweet, in this case honey and marmalade, to balance it out. Does the 'kid' eat these delicious (and slightly exotic) dishes with you? My kids and grandkids would be asking where the chicken nuggets were!! You look divine. That lace tunic is so Audrey or Princess Caroline. I love it on you. And your vineyard setting is stunning. These are some of my all time favorite photos of you and your great sense of style. Truly lovely, Andrea. Yes, the kid actually ate all the food; in fact, he ate almost all of the mozzarella and tomatoes and the salad... He also liked the goat cheese, which surprised me a bit... But he wasn't always adventurous... My husband started making him take two bites of all new foods he encountered (as well as foods we were eating that meal) when he was about 3 and got really picky (at that time he wanted to eat the same few food items over and over and stopped eating a lot of foods he had been eating). I was actually skeptical as I didn't want to make food a big deal. Our older son had always just eaten what we ate (even though when he was little, I offered him more "standard" food), and I didn't think getting into "food fights" was a good idea. However, now I'm actually really thankful and my husband's persistence paid off as the kid eats a wide variety of foods. But don't get me wrong, he still loves burgers!!! Thanks so much for your kind words about the tunic! I really love that it's different. Wine, beer, and fried cheese - yes, please! 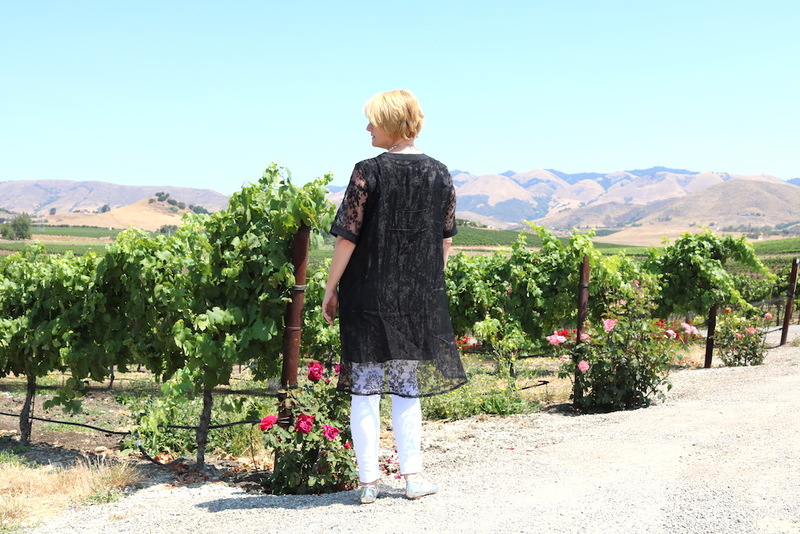 Love your pretty lace tunic. Indeed, what more could you ask for? The detailing on this tunic is spot on spectacular as well as the area where you went and the beautiful pictures! So pretty! We are headed to SLO in a about a month and can't wait to go! Might have to check out that place, although we'll have 4 kids with us and 4 adults...hmmm...any recommended places? Have a great time in SLO! I think Libertine is actually a great place for kids. It's casual with lots of space for little ones to roam around. They have the usual kid's menu, crayons, etc. And they have the most delicious house-brewed kombucha with 0.5% alcohol (it changes every few weeks, and the one I tasted was perfect; our sever said that it was his favorite one of the ones they brew). It's the perfect summer beverage in my opinion. We really like the beach in Pismo. We also love visiting Morro Bay and the beach there. Beautiful outfit Andrea...so elegant! It seems that you had a wonderful time in SLO...nice lunch! Your tunic looks amazing on you! What a stunning piece! This is such a wonderful casual elegant look. Classy. Those goat's cheese balls with orange marmalade made my mouth water! I need to make some of those for myself with a salad. Yes, goat cheese balls are such a nice addition to a salad. I used to make something similar; I'll have to make some again, too! What a beautiful look on you - I love all the details. My parents went to college in San Luis Obispo and it's such a beautiful area. I have yet to buy something from StyleWe but will definitely check them out. Gorgeous tunic! 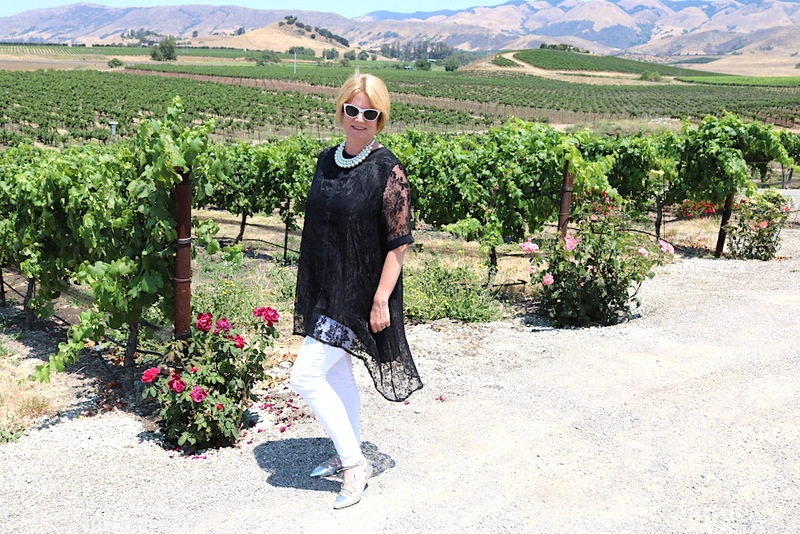 This is definitely a perfect outfit for a day of visiting wineries! 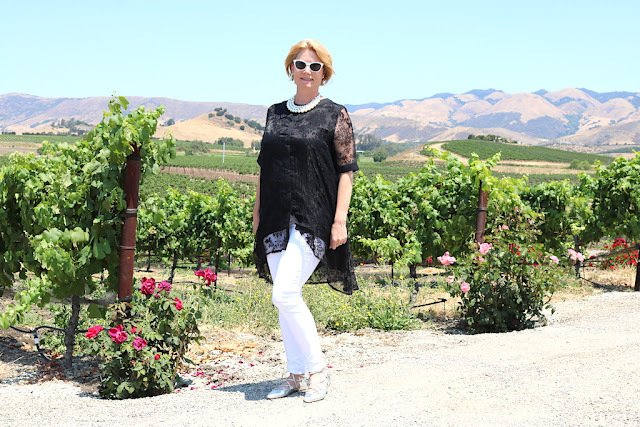 San Luis Obispo is such a wonderful place to vacation and it looks like you found some great wine and food! Fried goat cheese balls? Oh YUM! I love this lace top and the sheer lace panel on the bottom! I Would have never guessed you are 5'11! I am 5'7 so a little more on the tall side! 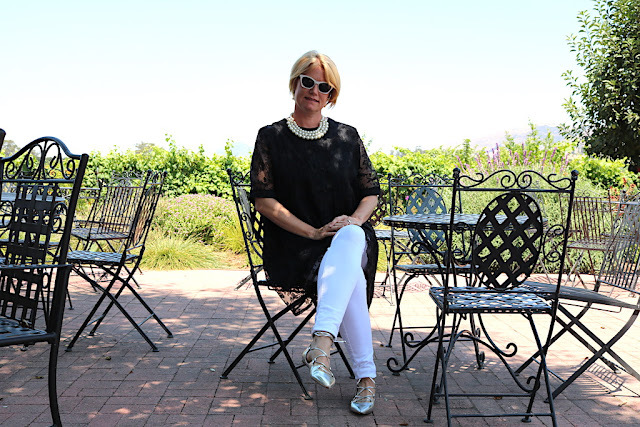 You look stunning in this black lace top and the "innocent" white pants! Great variation on the evergreen black and white! Thanks for linking up to Top of the the World Style. That tunic is so pretty on you! Love the black lace! Looks like a perfect day! That salmon platter looks so good! Thanks, Jill! It was a great day! Wow - I can see why you were drawn to this tunic! It is beautiful. I like how you styled it with your jeans and pearls. Thanks for linking up with Fabulous Friday, Andrea!